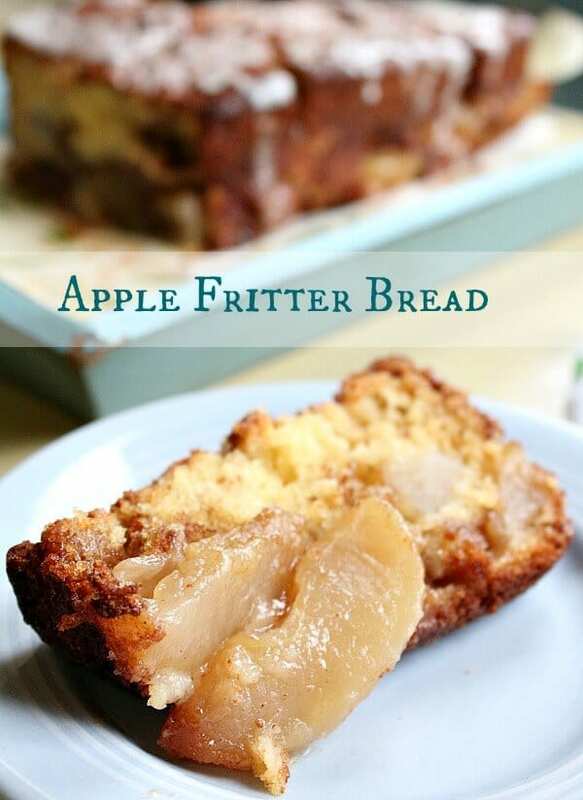 Apple Fritter Bread is a full of all of the apple and cinnamon goodness of apple fritters in the form of a quick bread. It’s a delicious addition to breakfast, brunch, or as an afternoon snack. Once cooled it is drizzled with a pecan whiskey glaze. When I was little we lived near Philadelphia for awhile. There was a restaurant nearby that was absolutely my favorite place to eat, mostly because they set out a big basket of apple fritters when they seated you. They were light, cinnamony, and jam-packed with apple flavor. I have never had anything like them anywhere else. So when I started seeing apple fritter bread popping up on Pinterest I knew it was only a matter of time until I made it. I looked at several recipes and decided to use the one in Rumbly in my Tumbly as the basic recipe. I used buttermilk to give it a little tang and add a more delicate, fluffy texture. I used apple pie filling just to save time. The one I use has no corn syrup in it and is really good. The one thing I would do differently is to take a minute to chop the apples up. The bread will slice more easily I think. Also, be sure to let this cool before trying to remove it from the pan. I don’t know if you can tell but I was in a hurry and the warm cake broke in pieces. I also added Pie Hole Pecan Pie Whiskey for flavor. There isn’t much but it really kicked it up and gave it a little blast of pecan. 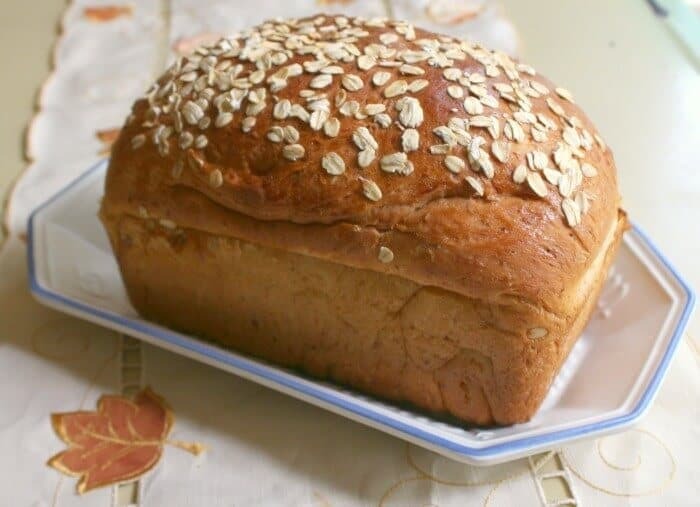 This is amazing as a breakfast bread, an addition to the brunch table, or an afternoon snack with coffee. Sweet, buttery quickbread, cinnamon topped apples, and super easy… what’s not to like? Sweet, buttery quick bread is layered with cinnamon topped apples in this easy to make recipe. It can be breakfast or a dessert -- your choice! Beat the white sugar and butter together until light and fluffy. Beat in eggs, 1 at a time, and beating about 1 minute after each addition. Combine flour, baking soda, salt, and baking powder together in a bowl. Spoon half the batter into the pan, evening out the top. Add the remaining batter in and top with the remaining apples and cinnamon mixture. If it begins to brown to much on the top just tent it with aluminum foil. Oh, Marye! This bread is speaking to me! 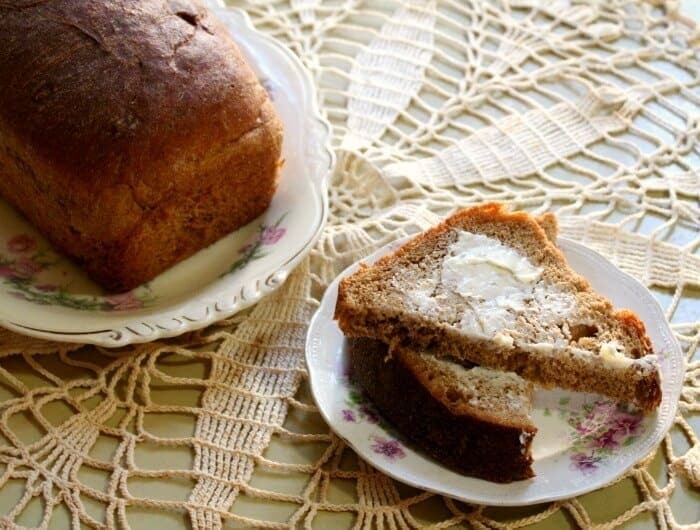 I’m so ready for fall, and this is the perfect autumn bread! Too funny! I just made apple fritter bread today! I have to say, yours looks better. Haha. Just gorgeous! And with that touch of whiskey, I’m sure all these flavors combine for the perfect “intro to fall” type treat! Yum! This sounds amazing! I love apple fritters so you know this will be on the short list! This looks incredible.Can’t wait to try it. Let me know what you think, Susan. I mean, really. Does it get any better than this? No ,I don’t think so ! This looks soooooo good! I love apple fritters, and could never really figure out how to make something similar at home! Great idea! Great recipe, and so easy to make! Oh man, this bread sounds amazing. I love that you took a fried apple fritter and made it into a bread. So much lower in calories. That’s true! I never thought about that aspect. Oh yeah, NOW we’re talkin’ breakfast of champions! Yum! Whenever I see apple fritters at a bakery, I have to get them…they are just so good! I’d love to try making this…my family would be thrilled. I’m sure it wouldn’t last very long around here! Your bread looks SO delicious! Thank you Michelle! I love apple fritters so much! We just started picking apples on our farm. This Fritter Bread looks so good. It’s perfect for fall. It really is… I am kinda jealous of your apple picking! They don’t grow here. Holy cow! That bread looks absolutely amazing!!! So smart to use apple pie filling! This looks amazing! I’ve never been a huge fan of apple fritters for some reason…but I can totally see myself digging in to this! It looks AMAZING!! What an easy recipe!! 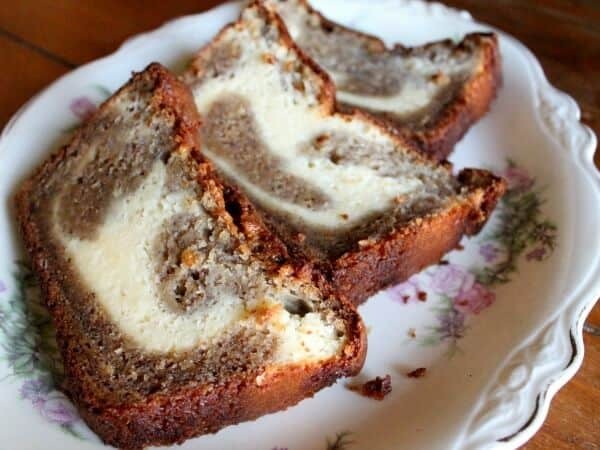 Genius to put whisky in the glaze! Pretty sure my hubby would have this gone in a matter of hours! It did disappear very quickly! This looks downright amazing! Pass me a fork! The buttermilk in this apple fritter bread recipe makes all the difference. What attention to detail and subtle flavors! Love it! LOVE the idea of putting some whiskey in the glaze. Yours turned out beautifully. Do you mind sharing the brand of Apple pie filling you used since you said it was so good and contains no corn syrup? Also, are there no other apples, other than what’s in the canned apple pie filling? Thanks, Marye. I really wish I had read this reply from you before I made the bread. I just read your comment and I made it with just any old pie filling I picked up on sale. It was pretty messy. Unless it’s supposed to be only something you serve in a bowl.